Members of the original Quorum of the Twelve Apostles. 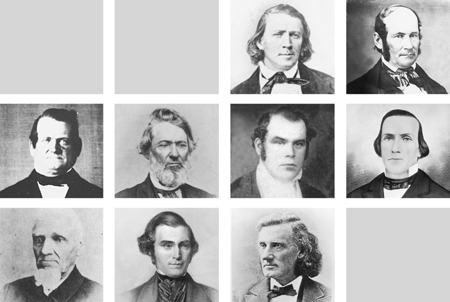 Top row, left to right: Thomas B. Marsh (no picture available), David W. Patten (no picture available), Brigham Young, Heber C. Kimball. Middle row: Orson Hyde, William E. M’Lellin, Parley P. Pratt, Luke S. Johnson. Bottom row: William B. Smith, Orson Pratt, John F. Boynton, Lyman E. Johnson. Thomas B. Marsh – excommunicated in 1839. Later rebaptized in 1857 but never resumed his place in the Quorum. David W. Patten – served faithfully. Killed at the Battle of Crooked River in 1839. Brigham Young – served faithfully. President of the Church until his death in 1877. Heber C. Kimball – served faithfully. First Counselor in First Presidency until his death in 1868. Orson Hyde – disfellowshiped in 1838. He was restored into full membership and position as a member of the Twelve in 1839. His position of seniority was reduced in 1875*. William E. McLellin – excommunicated in 1838. Parley P. Pratt – served faithfully. Murdered in 1857. Luke S. Johnson – excommunicated in 1838. Later rebaptized in 1846. He did not regain his position in the Twelve. Helped saints travel to Utah serving as a Captain of Ten, then later as a Captain of Fifty. Johnson would later serve as a Bishop in Utah, being the only man to ever serve as Bishop after having served as an apostle. William Smith – excommunicated in 1845. Orson Pratt – excommunicated in 1842. Rebaptized shortly after in 1843 and readmitted back into the Twelve. His position of seniority was reduced in 1875*. He was the last surviving member of the Original Twelve. John F. Boynton – excommunicated in 1837. Lyman E. Johnson – excommunicated in 1838. The members of the Original Twelve Apostles were placed in seniority based on their age. Thus, Thomas B. Marsh, being nearly 36 years old, was chosen as the Senior member of the Quorum. David W. Patten was said to have been older, although an exact age could not be determined due to him having no copy of a birth certificate. *When dealing with in the council of the Twelve Apostles in 1875, Brigham Young ruled that if a council member had been disciplined and removed from the council, his seniority was based on the date of readmission. By this ruling, both Orson Hyde and Orson Pratt were moved down in quorum seniority. As a result, John Taylor replaced Hyde as the President of the Quorum of the Twelve Aposltes. Therefore, Taylor rather than Hyde succeeded Brigham Young as President of the Church after Young’s death.